We’ve been selling Curated buckets of flowers at Plantpassion since we started, but we initially just sold them for Weddings and events, and they were large buckets of flowers, plenty to make lots of table displays. 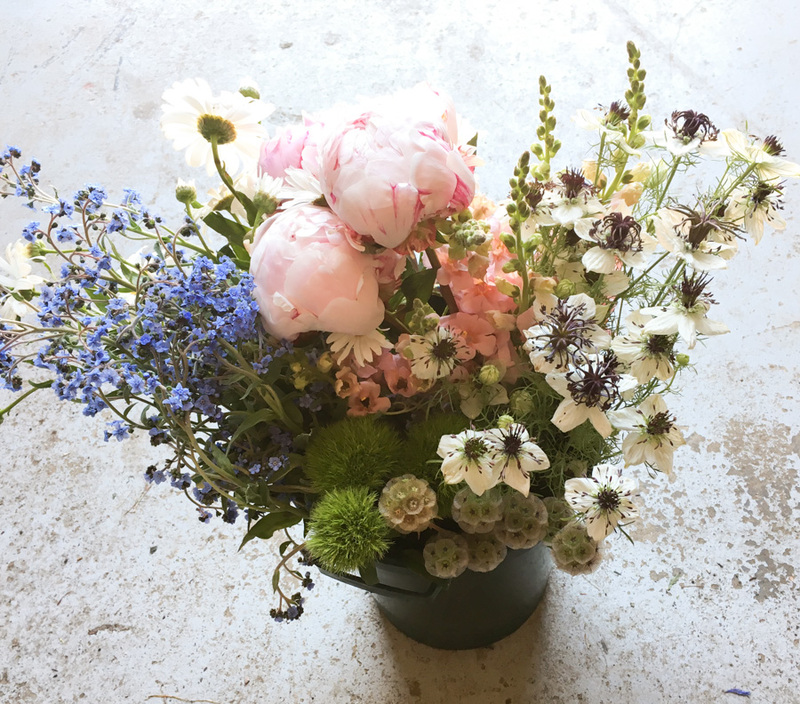 But for the last couple of years as well as our DIY event flowers we’ve been selling our flower arrangers bucket.A half sized option, which is our way of introducing our local flower lovers to the wide range of wonderful flowers and foliage that’s available at the field throughout the year. No 2 buckets are the same, simply because (as can be seen above) we have so many different flowers that we want to show people. But you’ll normally get about 6 different bunches. We always make sure that they are to a colour theme, and will contain some foliage and filler as well as flowers, so you can make up either one big vase, or several smaller ones. Unlike flowers that come from a supermarket or a wholesaler, these will have been properly conditioned in our cool barn, so that they last a long time in the vase. They’ll be ready for you to collect, or delivered locally in a bucket of water (not flat packed to squeeze through your letterbox). You just swap the bucket over when you next visit, or drop it back to us. If you like the idea of seeing what is available throughout the season, you can also buy a subscription, so that you get one each month, or more often if you want. Our subscription customers also get first call on the special flowers that we don’t have as many of. Like Peonies, Roses and Hydrangeas. They are often used by those who are creating church flowers, or trialing their floral arranging abilities. They are also used by those who are going to be making DIY event arrangements to practice with. If you’d like to try a flower arrangers bucket and you’re local to me in Clandon or Horsley in Surrey, please do get in touch. Easter Weekend. It’s just about the latest date that it can happen on, and that means the flowers are now in full spring swing. Here’s what we’ve been up to in the last week. Our 1st Wedding flowers of the season were collected. I was delighted that the first buckets of flowers went out to Pat and Iain, for their wedding today, Easter Saturday. Pat has been buying flower arrangers buckets from me for several years, to decorate her church and home. So i’m delighted she asked me to provide the wedding flowers. There are 12 peachy ranunculus in that back bucket which will be handed to her by family as she goes up the aisle to form a bunch of flowers, what a lovely idea. Thursday evening’s flower club was fully booked, and we talked about vases, and what flowers to put in different shapes. We looked at how tulips grow and open in the vase, and then we put that together by designing into a vase without that single use plastic (floral foam) Chicken wire structures were the order of the day. Obviously I forgot to take a picture of what we made, but everyone was so intent I had to remind that the sun was setting and we don’t have any electricity at the barn! Thank you ladies it was lovely to have an enthusiastic group (someone left a coat behind btw) The next date is Saturday 25th, when we’ll be talking about Ranunculus, and decorating your dinner tables. It’s now a year since The British Flowers book was published. It’s still being ordered in numbers each week, which means that Shelena (our postmistress) and I get to chat several times a week. It was very useful to show the brides who came to my Good Friday Bridal open day. I had a full morning of appointments, so if you are interested in locally grown, fresh flowers, and want to DIY some or all of you wedding displays, do come along to one of the next dates. As well as all the pretty stuff, the team have been really busy digging out compost heaps, planting more shrubs, and watering to make sure everything grows big and strong. I’m going to leave you with one of Emma’s shots from last year of me with Tulips. Our Photography workshop at the Farm in June is almost sold out already… (2 tickets left, so pop over quickly if you want one) and if you want to learn more about Flower photography at your own pace, her online course starts at the beginning of May. 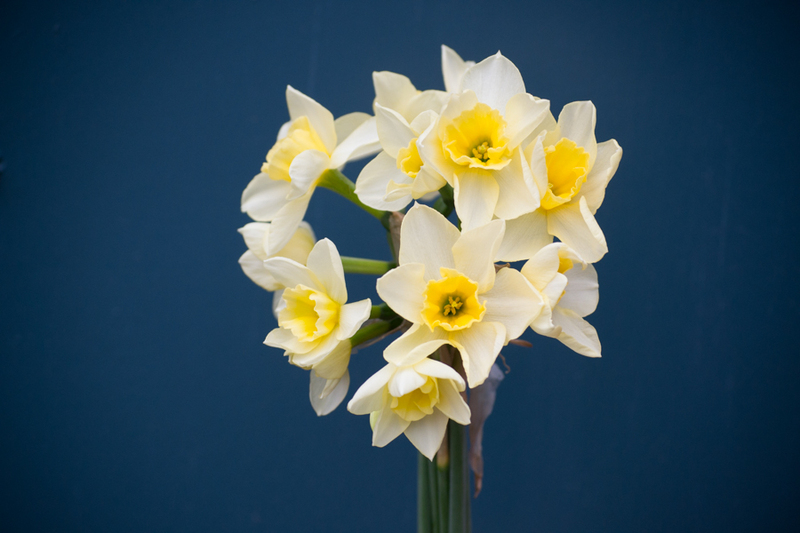 We’re used to blousy yellow Daffs in gardens and on roundabouts, so when I planted the Narcissus at the farm, I was thinking more about scents, and more subtlety. Creams to go with other colours in bouquets, and something different to what you can pick up at the supermarkets. So here’s a run down of the varieties that are going to be available from Plantpassion over the coming weeks. 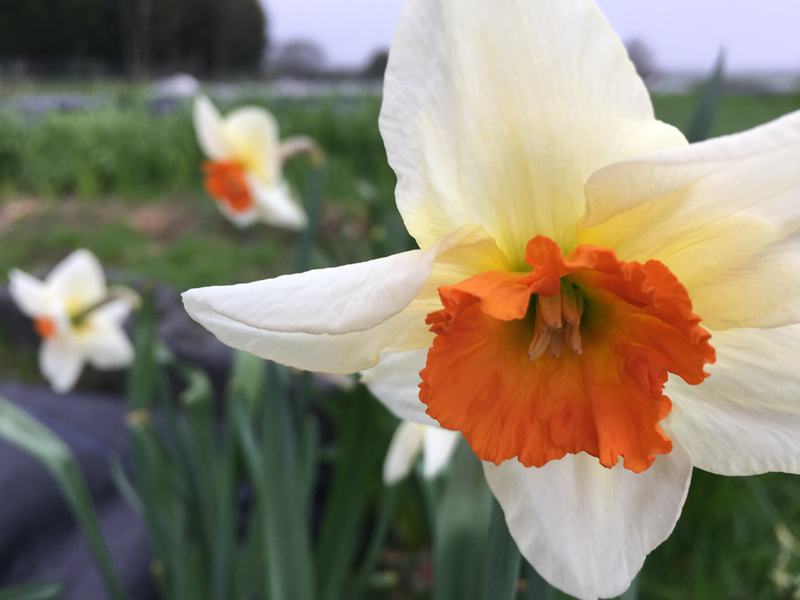 There are also several cheery narcissus with creamy colouring with and orange centre, including Actea. Over the next couple of weeks, we’ll also get more amazing scent from my favourite Duo, Sweet love and Pueblo, and then Winston Churchill and Geranium will join the party a week later. Sweet love - the honey scent on this is amazing. I’m looking forward to having the scent in the barn each morning, - maybe not so much to the bent double picking, but the season is started…..
My favourite compost, and the recycled Ecover bottle has worm leachate in it. Growing medium. I use Sylvagrow peat free compost. As a professional, I check the watering of my plants everyday so I use a peat free compost that I buy a few bags at time. If you don’t check the watering every day, you may need to use a compost with wetting agents in them. Even I don’t sow enough seeds to merit buying a Pallet each year, and I like to get fresh compost that hasn’t sat and got soggy and compacted. I have good local suppliers at RHS Wisley and Ripley Nurseries, and My Mum and Dad have Doves Barn Nursery near them. Sieve or Riddle. There may be obsessive tendencies here given how much I sow, but I find that by sieving the compost to get rid of the slightly larger particles, I get rid of any possible air gaps, and get excellent germination. The depth of the module or tray is quite important for some seeds, so getting deeper trays gives you extra time to get the pricked out and potted on. Labels. Try as I might, I’ve not found an alternative to a plastic label. We’ve tested many things over the years, (reusing cutlery, Lollipop sticks, plastic milk bottles) but only plastic labels and HB pencil work to keep plants named for over a year. As names and dates are so important to us, we make sure we reuse the labels, and use an eraser to take off and replace the pencil marks when needed. Watering can. A can with a fine rose is important. When I taught watering to the children at gardening club (many moons ago now) i’d compare watering little plants to having a shower, and big plants to having a bath. The little plants and germinating seedlings need a fine shower, the plants big enough to be planted out need a tap drenching at the roots. This is a pic of my favourite watering can. I did try some metal cans, but they didn’t last long. Watering can with fine rose, balancing on the stool that I kid myself I'll some day have enough time to sit down on! Here’s some of our keen group last week, their seedlings should now have germinated and they’ll be ready to prick them out. It’s moving towards mid February, it’s light when I get out of bed now, and I was still in the Greenhouse at 5pm yesterday. My Fingers are itching to start sowing seeds, so if like me you’re keen to be off, which ones will be successful from early sowing when the light levels are still fairly low? If you're a beginner gardener, I recommend the Spencer varieties. These are great for scented summer blooms. I love the blue of Noel Sutton, and the pink frilled edge of Anniversary. If sown this week, you are likely to have flowers at the beginning of July. 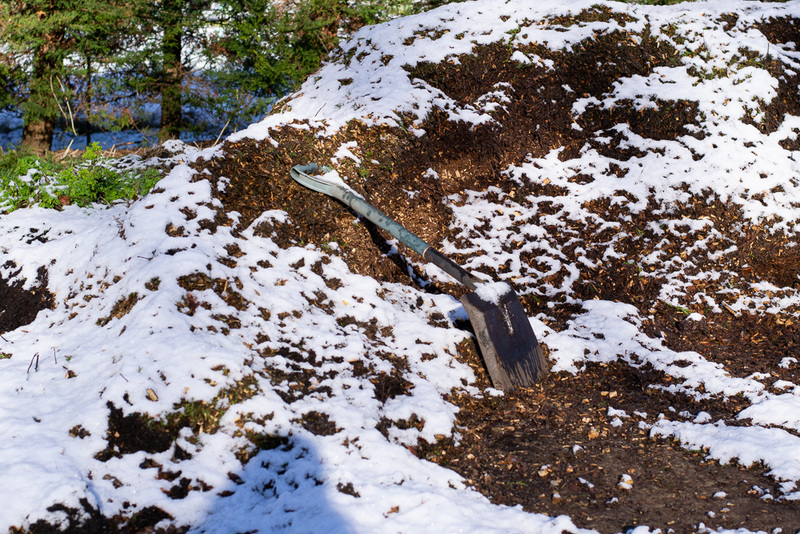 Make sure your compost is sieved, and add some vermiculite for good drainage, soak well when you’ve planted them. When they've got a good healthy root growth plant them out, but they often sulk for a couple of weeks after planting, so don't worry. There are lots of colours of cornflowers now, and as a cut flower, although fiddly to pick, they are beautiful on their own or with other things. if sowing early during February, don’t give them heat so they germinate slower than the normal 3-5 days, but won’t become leggy and difficult to handle. 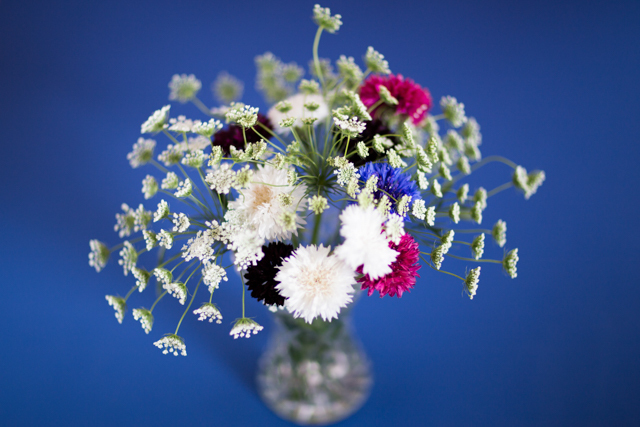 Ammi and Cornflowers grow so well together that really they shouldn't not be both grown. This was a picture (by Emma Davies) of one of my first arrangements, and just a few plants of each will give you a similar arrangement every week for several summer months. 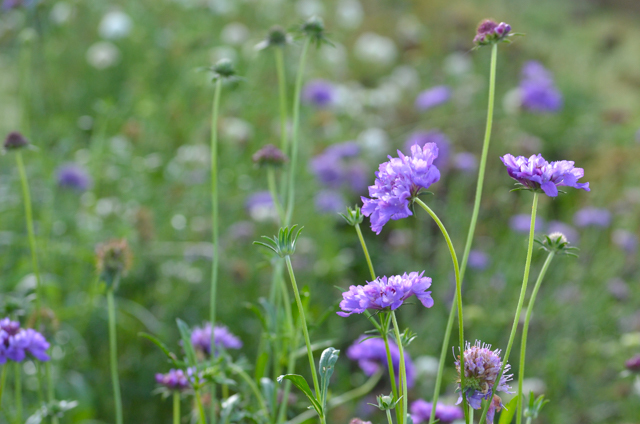 The Annual Scabious, are beautiful in the garden and in the vase, and now is a great time to be starting them. pick and pick and pick and pick, on as long stems as possible. They will start flowering in July from an Feb / early March sowing, then will have pause, but will reflower again in September. So, these are great suggestions for those with itchy fingers wanting to begin their seeds. But what should you NOT sow now? Although there was no sign of lying snow at home this morning, 2 miles away, and slightly up the Hill at the farm, it was a completely different story. Here’s some pictures of Hill top farm in the snow today. Shame the paper white narcissus are sulking and not coming out when they should! It’s going to be frozen again tomorrow, so i’ve now got together a whole list of barn jobs, we’ll be organised and ready for the season, even if we haven’t quite finished the weeding! So far, the January weather has been fairly kind to us. Just a couple of frosts, and the ground cleared during the day. it’s meant that we have carried on with both bed preparation and planting. Including making lots of wood chip paths that will reduce the weeding later on in the year considerably. As the ground hasn’t been frozen, it’s been fine for us to continue planting. Autumn sown Larkspur, Daucus (Dara and Carota) Ammi Visnaga and Orlaya have all been planted outside, and covered with Environmesh to prevent anything eating them. The bulbs are starting to emerge. The Narcissus and Alliums are some of the few crops that our wildlife doesn’t go for. 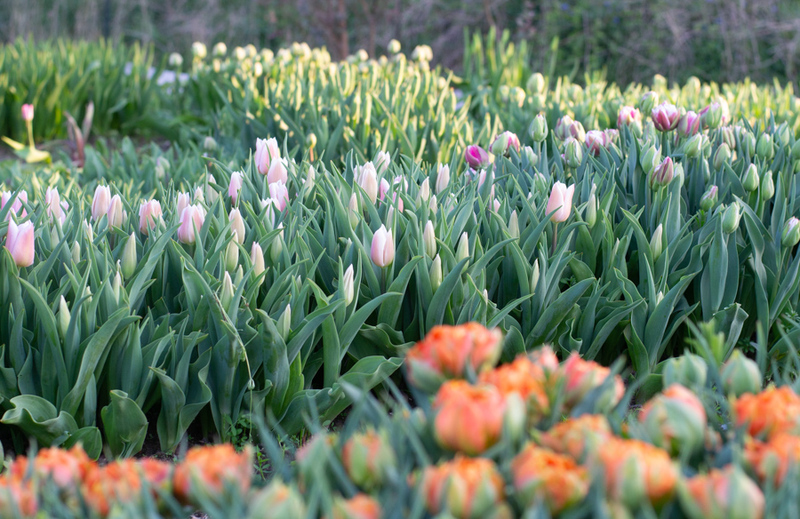 But the tulips will be covered very soon to stop nibbled tops. We’ve also had a big team effort this week to cut back, weed and net all the herb beds. Fresh Mint, Tarragon and Oregano shoots are deer and rabbit idea of bliss, so we hide them under netting until they’ve grown strong and tough. January is also for planning. The previous year’s Diaries and Notebooks have been perused and many scribbles made for this spring period. Now we’re going into our 7th Season, there are plenty of guidelines for times when we got it both right and wrong. Hopefully this year, we’ll be able to stick to the stated aims, although the weather will have some say in that. Obviously January is also Tax return season, so there’s been finishing off figures for that. The website has had plenty of work on it. New Workshops, Flower clubs and Open Day dates are all entered, so do pop over and have a look. These Hellebores are safe in the garden at home, where I can enjoy them! Happy New Year to you all, anyone else not quite sure what day of the week it is? I’ve had a fabulous relaxing Christmas period. Lots of lovely time with my family and friends, plus bits of admin and a couple of short but very productive sessions at the farm. i’ve obviously eaten too much and sat around even more, so i’m looking back to getting back into routines, from tomorrow, with maybe just a bit longer lie in than normal for the next week. The best bit for me is that we’ve now had the shortest day and so by the end of January, we’ll have more light in the mornings and i’ll feel more like getting up. There were some lovely “Useful for work” Christmas presents. Which i’m now making the most of . These pictures were all taken since Christmas or today 1st January with my new 50mm lens. I was also really pleased to get this lovely urn, which is going to be used lots this year, I can tell. My first arrangement was made with my Christmas flowers - All UK grown of course. So what are the plans for January? Well the greenhouses and grow tunnel at the farm are still full of plants, so we’ve plenty to get in the ground whenever it isn’t frozen. We’re still splitting and dividing perennials, and there will be excess plants for sale in February. Tray of larkspur nearly ready to be planted out. The Website has been updated with lots of new photos from last year, particularly the Wedding portfolio, and there will be even more in the coming month. In the meantime, i’ve got to make sure that the field plans are properly in place, and i’ll be letting you know about all the new goodies i’m growing later in the month. The Dahlias are out, The Tulips are half planted, so it must be time to be thinking about the winter wreaths, and make sure we’re gathering together all the best natural materials we can think of. They’re beautiful, but no-bling wreaths. to make sure that each one is individual, we use the best local foliages. Varied conifers, not just Christmas tree foliage. Berried evergreens like ivy and viburnum. Scented stems like rosemary and choisya, touches of colour from trachelospurnum, holly and crabapples. Then there’s plenty of decorations from pine cones, larch cones, feathers, dried flowers, and bark. No it’s not cinnamon sticks as decorations below, it’s eucalyptus bark, which rolls naturally. If you’re keen on plastic free christmas decorations, and want to keep your patronage local, then there isn’t a better choice for your winter wreath. If you fancy making something special for your front door your self, and would like to spend an evening learning how to craft your own Christmas creation, we still have a couple of places left on our Wreath workshop at High Clandon Vineyard’s glass barn. Spend an evening with friends, enjoying locally produced award winning champagne and nibbles, while you craft your own winter wreath to take home and hang on your door. As everything is hand produced and made to order, please do let us know if you’re interested asap. To encourage you to make up your mind, and so we can plan our schedule, we’ve £5 of all wreaths ordered before 30th November, here’s the link to reserve yours for delivery (locally) during the week commencing 10th December. It’s only the 31st October, but even before November has begun, our season is at an end. With freezing temperatures overnight twice this week, the Dahlias are completely gone. Our other tender plants have stopped producing flowers, and the half hardy annuals have gone from perky and producing to sad and soggy. So now it’s time to call a halt on the 2018 season, work on lots of preparation for 2019, and do plenty of reviewing of the year. Luckily I didn’t feel too bad, as the end of last week, we had lots of Pick your own customers, plus our last wedding of the season, so we used up plenty of the flowers. Thanks to all those who came and took part. After 6 season’s now we’ve really got to the point where we have a good idea of what we’re doing, so despite the dreadful weather for growers, the season’s sales have been better than ever before , and as always we’re really grateful for all our wonderful customers. This year there have been flowers for 24 weddings, (and quite a few parties as well) These were some of the last of the season. There were 20 weeks of Friday flowers, with the season going through Tulips, Ranunculus, Alliums, Cornflowers, Antirrhinums, Peonies, Hydrangeas, Phlox, Sunflowers, Dahlias, Gladioli and Chrysanthemums. A total of 22 florists have bought our flowers regularly, with 218 signing up to find out what’s available. So the Question i’m always asked is, - What do you do in the winter? Well we’ll be finishing planting the 1000’s of ranunculus, anemones, 5000 tulips and other bulbs that will make a large part of our April and May flowers. The Dahlias will all be lifted from the ground, and we’ll be storing them before propagating them in spring. Plus i’m working on workshops for next year. Dates are available already. I'm often asked what a week at Plantpassion actually consists of, so here's what the team got up to last week. Monday morning started off early with polytunnel watering, and then i had 2 collections of flowers, - 1 Growers Bucket for a florist, and one Flower arrangers bucket, for one of my local regular ladies. (similar things, just for different sets of people) the photo is the Yellow themed Growers bucket. The rest of the morning was the first of our Teenagers and the young at heart flower clubs, and Vicky, Jemima and William, learnt about vases and vessels, what flower shapes to look out for, and then had fun making a front facing vase arrangement to take home. The rest of Tuesday morning was made up of planting and weeding and watering, I was joined by Jennifer, my Mum and Dad, and my son, helping out. The heat ensured we gave up by lunchtime, so the afternoon was spent in front of a fan at home. Then there was an evening session back at the farm to make sure all the polytunnels were fully watered. Wednesday started early. My fabulous picking team of Seana, Liz and Laura making the huge difference from years gone by when i've had to harvest everything myself. By 9am before the heat of the day had really set in, we had a barn full ready for florist orders. Our Late July haul consisted of phlox, hydrangeas, ammi, statice, cosmos, scabious, antirrhinums, lavender, achillea, larkspur, amaranthus, and the first dahlias. Again the heat was too much by late morning, so after a couple of florist collections, I retreated home for a couple of hours. Then it was my Wednesday afternoon trip to Farnham to swap flowers with Bella from West End farm. 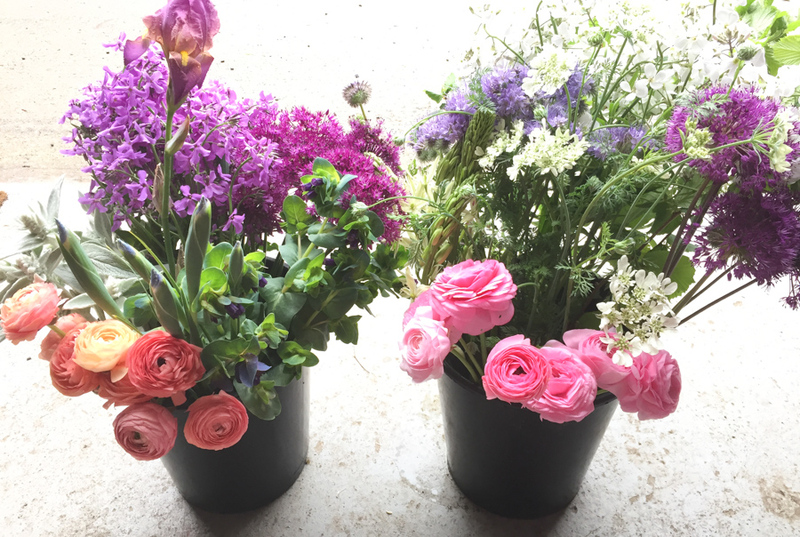 Working with another flower farm means we can offer local florists an even wider range (and i could top up my Roses and Achillea for this week's wedding - thanks Bella) The evening was some sweet pea picking and watering. Thursday dawned, with more picking, and several florist collections before 7.30am. We're often the 2nd pickup after New Covent Garden Market, so i get to see what's been bought there. Then Liz and I did another quick planting session before the heat of the day set in, and i left the drip irrigation hoses on while I retreated home in front of the fan to start the first of the week's wedding preparations. 42 degrees in the greenhouse, and 37 degrees outside in the "shade" of the house. it was hugely hot, but our flowers tend to cope with higher temperatures better than imports, because they havn't been in and out of fridges. We make sure that our buttonholes and bouquets are made with well conditioned flowers, picked at the coolest part of the day, and that helps them to survive longer. Thursday afternoon was when i made the buttonholes and corsages for this weekend's wedding. Here they are, all individual around a theme mini bouquets that will sit in a jam jar until just before they are needed to keep them fresh. Then on Thursday evening I did all the preparations for the bouquet making, checking through all the flower stems, sorting and ensuring they were all top quality and given the best chance to be at there absolute peak for the Saturday wedding. Friday morning was another early start. The Bridal bouquet, and 3 bridesmaids were finished and tied with their twool handles, and packaged in jars and boxes ready to go off with the Brides mum. The DIY buckets had their water refreshed, so they could be used straight away for displays when they got to their destination. DIY buckets of flowers, to a green, white and pastel theme, ready to go. Bridal bouquet with all the goodies from the field and garden. Bride and her maids ready to be packaged up. These flowers were collected before 8am, and were off to stay in an air conditioned office for the day. When they'd gone, i quickly cleared up the barn ready for a private workshop which has been booked for a group as a birthday present for ages. This group of ladies all classed themselves as beginners, most who rarely had flowers for the vase, but by the end of the session, they all made lovely individual hand tied bouquets. 5 successful hand tied bouquets. After a break for a spot of lunch, (and there may have been a quick 40 winks!) I was back at the farm in the late afternoon for a watering session, and getting together the Friday flowers. This week, it was 2 bouquets, 2 flower arrangers buckets and 1 bunch of Seasonal flowers to be delivered on my round of Horsley. (down from my high of 11 the week before :( ). Just to prove it's not all a case of work and no play, Friday evening was a lovely party at the allotment / community garden - Grace and Flavour. I was really glad that we've got our fantastic potting shed to shelter in, as we had the first rain in ages. As keen gardeners we were all full of glee, and the evening passed very pleasantly, helped by wine and shared allotment goody snacks. (if like me you are gluten free, then Courgette slices make excellent blinis!). Sunday was a rare day off as the Ride London Cycle race meant that Staple Lane was closed, and we couldn't get to the farm. Some Biennial pricking out was my only "work " for the day. However on the TV coverage there was quite a crowd of spectators in my gateway, so i'm hoping the Clandon Open Gardens sign (26th August) on the gate will get some of those spectators coming back at the end of the month. With a full day of rain, the cyclists may have been bedraggled, but the field was looking a lot happier. So there you are, a week at Plantpassion, - Flowers for florists, events and local people from a flower field in the Surrey Hills. i'm often told by my customers that they never pick any flowers from their garden. Now I live in a part of the country, where there are some gorgeous gardens, and there's a lot of choice for cut flowers in most gardens. Every supermarket, and farm shop and garden centre seems to sell flowers, plus they can get them from me in the form of Friday flowers, or flower arrangers buckets, but people are still reluctant to decorate their homes. One of the reasons (i've been told), is that people aren't confident to know how to arrange their flowers. This is the start of a series to get you happy and confident with what to do with your flowers, wherever you get them from, and how to make the most of whatever you've got. No "rules", just some ideas and inspiration to get you going. The first technique to master is pick and plonk. Before i started flower farming, this is what i did all the time. Whatever i picked from the garden or the allotment, i just picked and plonked in a bottle or a vase. Pick and plonk, can be one flower head, or a bunch of the same kind of flower heads. The only thing you'll need is a vessel that is the appropriate size for the flowers. Tomato ketchup, Firefly drink, and pasta sauce jars all making excellent vases. 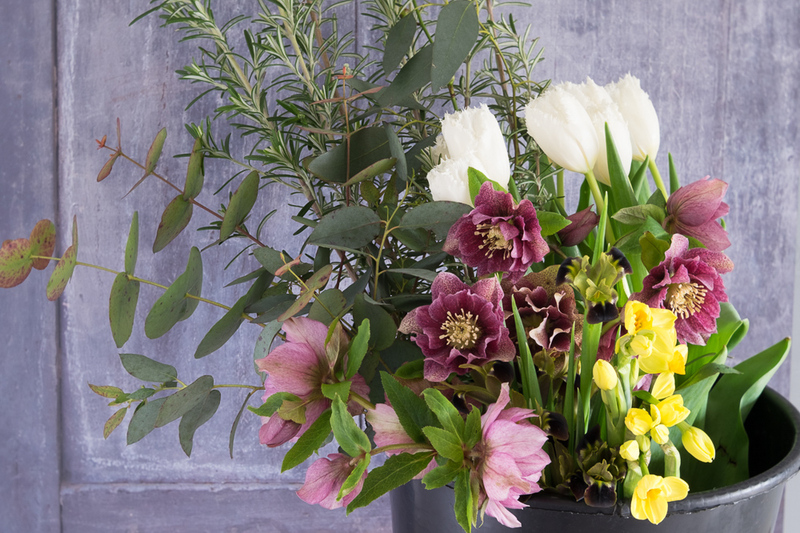 Pick and plonk is great for flowers bought from the supermarket. Just take off the wrapping, cut a small amount off the end (so they start taking up the water) and put in the vase. and it doesn't have to only be traditional "flowers" that can be pick and plonked into a vase to decorate your home. How about other additions from the garden? There are plenty of foliage, and stems from the vegetable patch that can used as pick and plonk candidates. Amaranthus red army, and caudatus, which are grown on the vegetable patch, as well as the flower garden. When you get your flowers from Plantpassion, they'll already be conditioned. This means that unlike market flowers, you don't need to cut the ends, soak them overnight, or strip off foliage or take off side shoots or deadhead and divide up the bundles. Our stems will come ready for you to use except cutting to length. However there are quite a few things that you can do to make sure they stay as fresh as possible. Here's our suggestions. 1) when you take them home in the car, wedge them in (gently) in the footwell, so that the buckets don't fall over the first corner you take. We can provide you with buckets if you are able to recycle them back to us within a week - if not, please bring some of your own. 2) when you get them home, transfer them into fresh water, - either into fresh/ more buckets or rinse out the buckets you've brought them home in and fill again. They should ideally be half full of water, and do check that in the moving of them the stems are all at the same length, and they're all still in the water. 3) if you're not using them straight away, store them in a cool dark place. Note they don't have to be cold, just cool. These flowers have been grown on a field, and the only travelling they've done is home in your car, so they're not used to refrigerated temperatures and won't need cold as you're going to use them in the next day or 2. My Hall and downstairs cloakroom are the best places in my house, or a spare bedroom with the curtains closed is good. A garage or a shed in summer is not a good idea as it will have extremes of temperature. 5) Your flowers have been picked to be open perfectly at the time of your wedding, so when you pick them up a day or so before, they will need to open just a bit more. We've done all the work for you, picking them at the correct stage, so if you follow the instructions above, they'll look wonderful for your wedding. If you want them to carry on looking lovely afterwards, do remember to take vases / or jam jars with you to put any bouquets back in, especially if you're having photos later in the day. Because they're fresh flowers, we're often told that our table flowers last well over a week, but we do use blooms like Roses which are at their peak, so may need deadheading, while the others carry on flowering. 6) Enjoy your flowers and your Wedding party, and do please send us photos of how the flowers looked, particularly if you've arranged them yourselves. I'm often asked questions that I've given the answers to a hundred times before, but of course that doesn't mean that everyone knows, so here's some straightforward answers to Can I buy your flowers? and other questions, for you to refer to. Where can i buy your flowers? - and how can i pay? From us by placing an order online, by email, or by text. You can pay by credit card through the Stripe system, or I can invoice you so you can pay me directly by Bacs, or you can pay cash on delivery/ collection, or you can send me a cheque. We can deliver to you, (Between Guildford and Cobham) or you can arrange a time to collect from the barn. Online or email orders are preferred as then I know i have all the correct information, and i don't have to get my gloves off and get up off my knees if i'm on the field to answer a telephone call or text. When will I get your flowers if i order today? Because we are dealing with flowers that we grow, rather than are bought in, we have to pick and condition our flowers before they go out to you. If you order before 9.30am Monday- Friday then you'll have caught us while we're picking, and we can deliver to you later that day. If you place an order later in the day, it will be next day delivery unless we've picked too much!. Just occasionally, I do have a day off, and my team only work with me Tuesday-Friday, so please do give more notice if you can. We also sell Friday flowers, and subscription flowers, so those have set dates for delivery, whenever you order them. Do you send your flowers to someone further away? I sell locally, and don't send flowers, as I believe they are better locally grown. However i'm a proud member of Flowers from the Farm, so please use their map to find a grower near to where you want to send flowers. I'd love to buy flowers, but i've no idea how to arrange them! We can either make bouquets for you which we send in a vase (there's £5 off your next order if you recycle it to us as well), But we also have a flower club twice each month to teach you about flower arranging, and give you confidence with using seasonal flowers. How do I find out more about your flowers, and get reminders of what you have available? Just after I set up the flower farm almost 5 and a half years ago, I went to a meeting of other flower farmers in Devon. There I met Gill Hodgson, the founder of Flowers from the Farm, and became a member, of a group of (then) about 30 growers across the country. This week, Flowers from the Farm is promoting British Flowers at the pinnacle of horticultural excellence - The Chelsea flower show. In the centre of the Great Marquee is a stand showcasing the best in locally grown seasonal blooms created and designed by FFTF members. It has flowers supplied by FFTF members (94 of them) and is sponsored by members (now over 500 of them) and has no external funding. So are my flowers there on the stand? Well, no actually one of the most wonderful parts of Flowers from the Farm is that there are now so many capable, experienced and talented members, growing in gardens, allotments, fields and glasshouses, and working as a team sharing knowledge and experiences, that between us, we can promote British Flowers all over the country without over stretching us all and creating problems in our individual businesses. My flowers will be off to Hampton Court at the beginning of July to continue educating the public that locally grown and seasonal flowers are the best. I have to say though that thanks to one of my regular florists, there are some of my flowers gracing a couple of the display stands at the RHS Chelsea flowers show, and there's a copy of my book there somewhere to help with any reference queries. So i'm a really proud member of Flowers from the Farm. 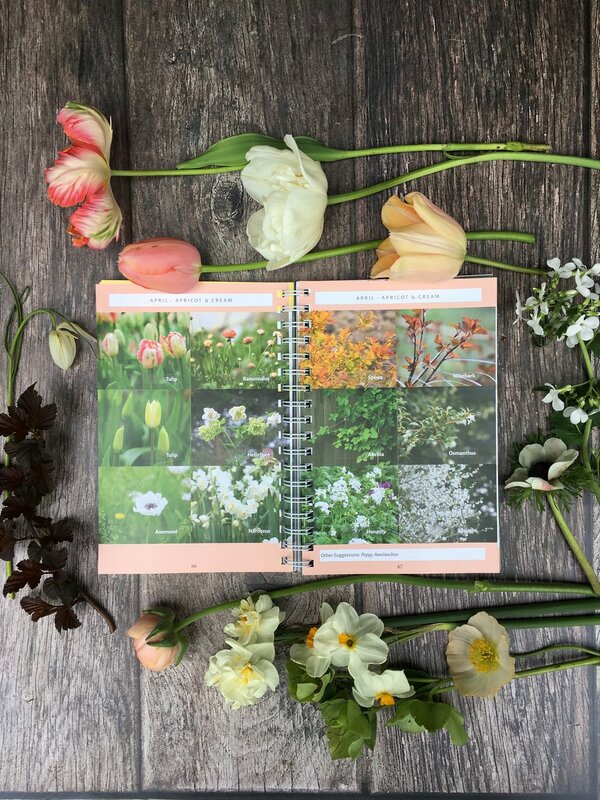 If you're planning to go to the Chelsea flower show this week, please do go and find the FFTF team and enjoy the full range of the flowers available in May. If not, join me on the sofa on Wednesday evening at 7pm on BBC 2. Yesterday we had a lovely group of new (to us) Florists come to the field. We love giving this chance to florists to see the field producing it's goodies. They are used to the already picked and travelled plastic wraps of the wholesaler, market or dutch lorry. As we wander round the rows, in the sunshine (avoiding molehills admittedly) they get to see the flowers in bud on the plants, the plants that will become flowers in weeks or months time, and the picked blooms sitting in buckets of water in our cool barn without being bunched, sorted or counted into wraps. If you'd like to see what's likely to be available from a flower farm in Surrey in May, and you're a florist or student of floristry, then please do come along to our next Open Day this Thursday 17th, anytime between 10 and 1pm. - Fill in the form to let us know you're coming so we've got enough flapjack. Today it almost felt like Spring, and i've been out in the garden, and at the farm making lists for what needs planting in the next few weeks. I've had a few days off with my boys over half term, which has meant i'm fired up and ready to start seed sowing and attacking my inbox, which is full of Wedding and party enquiries. Amita was keen on a neutral flower colour scheme, and a week before the wedding i was worrying a bit as all the best flowers on the field seemed to be bright. In the end though there were plenty of blooms and a wide selection of green and white. We had the last of the Tulips, the first of the White Ranunculus, and lots of Anemones, Special Colibri Poppies, Sweet rocket, and plenty of green and white foliages. This bouquet was quite a bit larger than most wedding bouquets i make, but the scented Viburnum and Mexican orange blossom shrubs provided a great backdrop, and the Bleeding heart (Dicentra) and Solomons Seal, provided great interest and movement in the bouquet. 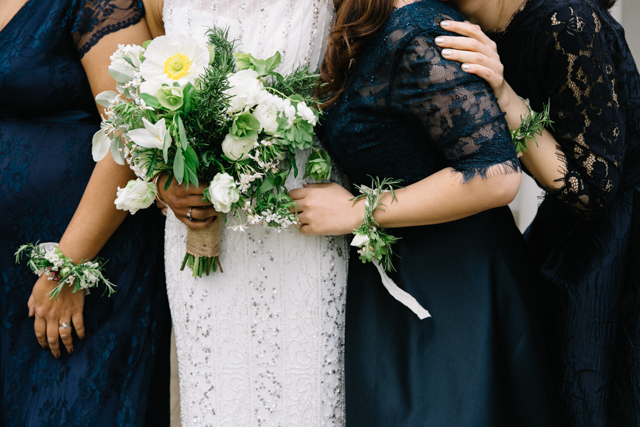 Instead of Bridesmaid bouquets, Amita's 4 bridemaids had a wrist corsage each. These were all individually wired and had hand dyed ribbon to tie them on. The Rosemary, Maythorn, Ranunculus and Anemones gave a lovely different effect to a hand held bouquet, and were showed off wonderfully against the lovely Navy blue dresses. For the table decorations Amita and her Bridesmaids found the most amazing collection of bottles and jars, for us to fill, and we had 5 lovely containers for each table to theme. I loved seeing how these were displayed at the venue. Thank you Amita and Pete, for trusting me to provide you with all locally grown flowers. For labelling your vases and containers beautifully to make my job easy. Thanks also to your lovely bridesmaids who collected the bouquets and containers on the morning of the wedding, oohed and ahed in all the right places to make a very early morning finishing off worthwhile. February is now here, phew, and it's brought with it buds, and the first of this season's flowers. 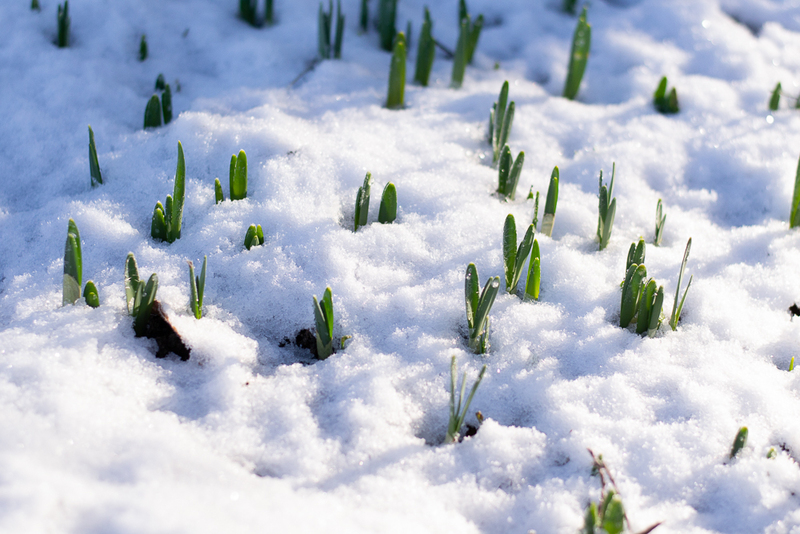 The Snowdrops (Galanthus), Snowflakes (Leucojum) and Hellebores are now budding and starting to flower, and the Muscari, Hyacinths, Narssisus and Tulips are poking through. of course there are now plenty of winter foliage plants on the field, so we're working our way through the Eucalyptus, Viburnum, Rosemary, Senicio, Pittosporum and Sage, and this week we've been pruning the Willow to make our Valentine hearts. I've grown Sweet peas for many years. I love them, but while i've always managed a few jam jars of scented flowers I have to admit that i haven't always been completely successful at growing to cover the full season. Plus as a flower farmer, even when i've grown them, i havn't always made enough money from them to make them worthwhile. Last year though after 4 years of trialling, they were great. Starting flowering in late April, and continuing on until September, with just a slight lull at the end of June, so i'm trying to copy everything for this year, to try and get good results again. The first Sweet peas that will flower this season are the Winter Sunshine variety Opal. These are special varieties that can start flowering when only getting 10 hours of sunlight. Whereas the summer Spencer varieties need at least 12-14 hours of light. I've tried several of the winter sunshine colours, but Opal,which is a pearlescent pink, is the strongest and longest stemmed variety. This picture is of Opal last year on the 2nd May by which point I was picking a bunch like this 3 times a week from 40 plants. Below is my tray of Opal Sweet pea plants just before Christmas that i've just planted out in the greenhouse. These were sown on 9th October. Plus the greenhouse that we've planted them in (and the "help" I had to get the support netting in place) I've also got some of the winter variety Oyama's purple which i haven't grown for a few years, and i'll add just a few of them in with the Opal. Also sown in October were my (hopefully) June flowering Sweet peas that will take over from the Opal. These are a Grandiflora variety called April in Paris. They flowered brilliantly for me last year at the Allotment, and the other Grandiflora varieties that i planted for a June wedding last year, were flowering perfectly, so fingers crossed. They will be planted outside at the beginning of March. So now these greenhouse ones are planted, - what about my sowing schedule? for the rest of the season? Last year i sowed in January, March and April. That's what I plan to do this year too. I've got varieties Anniversary, (pink) Invicta (white) Windsor (Maroon) - all tried and tested. Plus i've got 3 varieties of blue, Just Julia, Top Hat and Heathcliff. I'll let you know how i get on.